First of all, I'd like to say that it wasn't my fault. Mommy was the one who left the bag from our shopping trip, to the Pet Store yesterday, on the floor. I merely took advantage of the opportunity. Which of you would say they'd have done differently? Hmm? It's just too bad I only got through 1/3 of the Rollover before they spotted it. In other news, I know I've bumped the Nose Report, I'll see about posting that tomorrow. Sorry about that. I just needed to get my story out, you know how it is eh? Oh, Mommy also said I'm on the magic list for tomorrow. Anyone have any ideas what a magic list is? Or what it's for? Good Morning Everyone! Happy Monday Morning Report! I apologize for not blogging over the weekend, but I was busy! I even got a chance to help Daddy nap! For 3 HOURS! Phew! That was a tough one. I spent some time curled up behind his knees, and then stretched out on Mommy's side of the bed, a bit of time with my head on his foot. Mommy didn't take pictures, something to do with the flash waking him up. Funny she doesn't mind using the flash on me when I'm "sleeping". But then, I'm a Pei-fessional model. Pei laughter. So I did some looking out over my backyard, until Mommy called me to take a picture. I watched Daddy eat his lunch, to make sure he didn't choke on anything. I hid in the garden for a bit. If it weren't for my collar, I could have blended into the fence. Darn it. And then someone mentioned ADVENTURE! So I made sure to let them know I was ready for action! Good morning evening and afternoon! Welcome to Bolo's Friday Weather Report and Other Adventures. Our weather today is Foggy. I'm hoping the sun will burn through the fog and grey clouds, but it's not looking good. So I'm posting a picture of me in the sun. This is how it should be everyday. Not too warm, not too cold, a nice sun beam, a nice breeze and a good yawn. Oh, and a cookie or five wouldn't be so bad either! Pei laughter. Thank you to everyone yesterday who cheered me up. It's nice to be loved. Pei kisses to all of you. So I had an adventure this morning to take Daddy to work. We stopped at the donut shop to get coffee and a breakfast sandwhich. Oh andDaddy got Mommy a cookie. It was me and a small field of potentillas (which is about the only shrub Mommy knows the name for). I made sure to leave a lot of pee-mail. Mommy and I came home and we had cookies together. That's Love. Mine was a honey bone. Num num. It was DEEEE-Licious! I'm pretty sure they'll be another adventure this afternoon because I'm going to have to go and RESCUE Daddy from work. It's a tough job but somepuppy has to do it. Mommy also mentioned that I need more rollover, so I think there's a trip to the pet store in store for us. Oh boy! I can't wait! Hello all. I'm sorry I didn't write yesterday but I was feeling a little not myself. See, after a great walk with Mom in the morning and a wonderful nap, I kind of, well, had an accident. That's so not like me but you know when you get REALLY excited and you have to piddle? Yeah. On Mommy's side of the bed. At least it wasn't on her pillow. But then, I don't get to play with pillows anymore after I killed the last four by destuffing them. Pei sigh. I apologized but I just wasn't feeling up to writing. Even today I'm being subdude. I know Mommy and Daddy aren't blaming me but my self-esteem took a dive yesterday. You know how it is eh? Anyway, I'm not feeling chatty, sorry. I'll read everyone's blogs and then go back for a nap. Or maybe I can give Mom my face to cuddle and she'll take me out for an adventure. Even if it's just a little one. It's time for another Nose Report! I'm your Reporter Pei, Bolo, Welcome. Meet our first guest. The Snow Leopard. He has a kissable nose. But he might be dangerous so don't get too close at first, I wouldn't want to loose any friends because of him. Now this guy is safe to kiss on the nose, he's a Mouflon. With a cute nose. This is a Papa Mouflon. His nose might be kissable, but I think his appearence is off putting. He doesn't look like he wants nose kisses, strange as it may seem to say that, I mean, who DOESN"T want nose kisses? Many people don't know this, but birds have noses. This is a Blue Crested (Crowned) Motmot. He does have a small kissable nose. I don't know what this bird is, but he has a NOSE! Some birds have tiny noses that you can barely find. Not this guy! Mom says these two are Sunbitterns. I like the colours on that one at the back's wing. Cool eh? Their noses are easily found and kissable. Meet the Spectacled Owl. The picture is fuzzy, Mommy is still learning her camera apparently. That's ok, we still love you Mom! Nose is easy to find, but some doggies and kitties might find them a little intimidating. This is another Owl. Mommy thinks maybe a Screech owl but she's not sure. Again, easily found nose. But he doesn't look like he wants nose kisses does he? Hmmm. This is a Black Tailed Prairie Dog. He's a dog! But he looks like a Squirrel! He must have a serious identity crisis. Does he chase himself do you think? Anyway, kissable nose, definately! Meet Cuvier's Smooth Fronted Caiman. Nose is easy to find, that's for sure. The kissability factor, uhm, ok. He's a little intimidating too if you ask me. I really don't trust that smile. Then there's this guy, he keeps showing up in my blog. Now THAT"S a kissable nose right? Pei laughter. That's all from the Nose Report, I'm Reporter Pei Bolo, until next time! Good morning every puppy! Oh, and Kitty. I have to say that, I have Cat readers now. I thought I'd start the day with a body picture. Mommy tends to focus on my nose, seeing as how it has a fan club, but I thought you needed to see the WHOLE Pei. Except my front feet apparently. Meh, whatever, that's still a nice picture. Good job Mom. I had an ok weekend, not enough cuddles - never enough cuddles in my opinion actually - but we did some fun stuff. I went over to Uncle Brett's and barked at Wash. I was SO excited to see him! He ran away. Maybe I was too intimidating. Pei sigh. Mommy woke me up with nose kisses and cuddles this morning. I was curled up behind Daddy's knees and when he got up to shower, Mommy came to cuddle me. She even - wait for it - rubbed my tummy! I know she likes it so I let my leg do that scratchy thing and it put a smile on her face. The things I do for her! Plans for today, help Mommy do laundry and get the paint off the window next to the front door so that I can see out with no problems. I like this plan! It's Saturday again! That means that both my people are home with me! Daddy said he had to work in the shop, Mommy isn't sure what she's doing today and I think I'm going to nap. But having both of them here means I'll get even more spontaneous cuddle sessions! Hmm, although those do interfere with my naps. 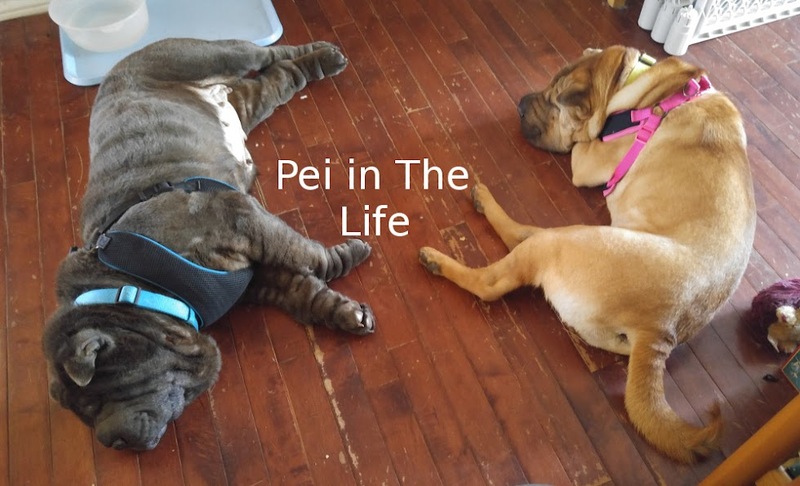 What's a pei to do!?!?!? I need to send out a special cuddle to my Grandma who had surgery yesterday and sailed through it with no problems. Is there room on the sofa next to you? I can cuddle up. Virtual Pei Kisses. That's my fan club from one of our Tuesday Night Baseball Adventures. I was talking with their Dad yesterday and I found out that THEY READ MY BLOG! So a special hello to my Fan Club! Nose Kisses! Ok, there was something else.... Oh yes! I have put my name down for the Dogs With Blogs Holiday Card Exchange! Mommy and Daddy are as keen on this as I am apparently. They're discussing what should be on the card I send out. Click on the button you'll see over on the side if you want in on the exchange. I think that's everything. I'd better get back to my early morning nap. I need it to give me energy for my mid morning nap. Pei laughter. Good Morning and welcome to Bolo's Friday Weather Report and Other Adventures! Looks like it's going to be a Beautiful Day! Watch it though, it's chilly here. We hit 2 degrees Celcius this morning. That's close to freezing. Mommy complained about having to scrape the car to drive Daddy to work this morning. That was my morning Adventure too! I helped drive Daddy to work! It was tough, but I managed it. I even managed not to whimper as he left the car. That's always sad when he does that. I miss him so much during the day. I think he knows it too because I always greet him with a waggy tail (Mom Edit- Waggy Body, Bolo wags with his whole Body when he's happy to see us) and nose kisses. I mean, how could you NOT miss that? I'd like to introduce you to Uncle Brett's cats. I've only met Keiko, but Uncle Brett thinks Wash and I would have fun together. I'm game. I've never really played with a cat before. So this is Keiko. She's a regular cat Uncle Brett rescued a long long looooooonnng time ago. (I don't want to say that she's old because it'll get back to her and I'll be in trouble, she's tough). She's not a friendly cat to Mommy. She'll tolerate Daddy. She has Cat-i-tude. That's ok, we'll just avoid her when we visit. This is Mera. She's only about 8 months old. She is an Occicat. With chocolate stripes. She's friendlier, but seems a little shy, according to Mommy and Daddy. And this is Wash. He's also an Occicat, but he has lighter stripes and polka dots. He's not shy at all. He's younger than Mera but bigger than her. Uncle Brett wants to see if Wash will play with me. I'm game! And then you should recognize this face, and if you don't, you need to read more of my blog! Pei laughter. That's all my news for now. I'm hoping there's another Rescue Daddy mission for this afternoon. I'd better nap to conserve energy. Don't forget to check out this Wednesday's Adventures HERE, you may have won an Award! Oh, and I have some new readers and commentators! Hi there to ABSharPei, who seems to be a cat with Shar Pei Puppies. I'm not sure I get it. Mom's going to have to work on her French reading so I can figure out what's going on. A big Hi! to Texas Sun Dogs. Yes please, add me to your reading list! I love being on reading/friend lists. Mom and I will check out those Blog today. So, some of you need to pick up your awards from yesterday. Click HERE for a listing. Today was supposed to be my morning cuddling with Mom, but she's been called into work for a double shift, whatever that is. It can't be that good, it takes her away from ME. It's a good thing we had some mondo huge cuddle time last night while she and Daddy watched something on TV. All this, of course, was after my huge adventure to go and rescue Daddy from work yesterday! We got there and I pulled Mommy to sniff all the interesting places. Trust me, there were LOTS of interesting places. That harness that I wear is supposed to be an anti-tug harness. Mommy doesn't think it works properly. Pei laughter. Hello Daddy. I'm having an Adventure! Do you want to come? Hello? Anyone in there? No! I'm not ready to go in the car! I'm sure I missed sniffing a place. Oh alright. But there better be a cuddle in my future. Oh, and maybe a cookie. Stay tuned tomorrow for more Adventures! Pei-Ess, Eduardo, I'd love to be on your Snuggle Bud list! Look what I got! It was a gift from Charlie Daniels! Thanks Charlie! Wow, that even kind of looks like my paw! I don't have much time to write this morning, Mommy is trying to push me out the door to pee and I'm not ready yet, I'm still waking up and I need my cuddle. So I'll add who I want to give this award to later today, if nobody minds. I can give you a hint, it'll be everyone! Pei Laughter. OK, I'm finally awake, and I've even been on an Adventure, pics on that tomorrow. I'd like to send that Golden Paw out to as many people as I can. Charlie Daniels, can I give a Paw back to you? If I can, you deserve it. One to Eduardo, for being Snuggly and looking after his Mom so well. He's an inspiration. Gaia, Maggie and Mitch and Willow because Mommy has weird memories of being french kissed by an Airedale. I'm not asking, I don't want to know. In fact, I'm probably too young to know. Mango, Dexter and Hector, because c'mon, they're Mango, Dexter and Hector. 'Nuff said. Oorvi, because HELLO! Everyone Loves Oorvi! I also want to send one out to a friend I just met, Dannan and The Girl. Hi! Nice to meet you! Grab a Paw! Now I just have to keep checking all the blogs for new updates to let them know they have an award. Hello and welcome to Bolo's Nose Report! I'm your Reporter Pei, Bolo. If you've been following the Nose Report, you know that my pawrents went to the Metro Toronto Zoo and got pictures of all sorts of animals for me to check out their nose kissability. So far, the only animal we've seen to come close to me kissable nose is the Wombat. This according to my friend Mango. Here are our guest animals for todays Nose Report. Please give a round of applause to our first guest, the Siberian Tiger. This tiger knows it's nose is kissable, see, it's kissing it already. Here we have botht eh One Humped Camel (dromedary) and the Two Humped Camel (Bactrian). No Grandad, there are no Three Humped Camels. I know he's going to ask just to be silly. They certainly have noses, and flappy lips. Kissability factor? Not sure, I couldn't get close enough to check. This little guy is a cute one, if I say so myself. He's a Przewalski's Horse I think he could also be a contender for nose kissability. Meet the European Reindeer. Nose, yes, kisability, certainly. And finally, the Asiatic Wild Dog or Dhole. I'm looking at him and remembering the little dog that attacked me at the beginning of the summer and I'm wondering if they're related. Hmmm. I don't like to hold grudges, but.... someone else can check on his nose kissability I think. And just to keep you going, MY nose. I know it has a fan club. That's it for me, Report Pei Bolo signing off until next time. Welcome to Bolo's Monday Morning Report! I'm your host Bolo! I would like to introduce you to my Squeaky Squirrel. It's supposed to be a Hide and Seek type game but I'm not into Hide and Seek Games. I'm into Squeak the Squeaker games! I got a box for my birthday on Friday! The squirrels fit very nicely into my mouth and then I run around the house chewing on them. It make a great sound. Mommy and Daddy love hearing me squeak things, I can tell. Grandma and Grandad got me Squeaky Squirrels for Christmas last year and Mommy gave me one while they all opened the rest of their presents and I remember Grandma and Grandad were very surprised at how insistent my squeaking was. Granny was the one who first gave me the squirrels when I was just a little puppy. Here are pictures from my first squirrels ever! On a side note, I see that you can buy extra squirrels. That picture of the squirrels (the one at the top, not the ones with me in it) is from a local pet store's website, Critter Jungle. Mommy has a friend who works there. Maybe we should go and visit and get more squirrels. Mom? Mom? Ask Daddy for the car please! That's Daddy swinging at the apple on the pell for a cutting demonstration. Behind him are Austin, Pierre and David. They were all fighting in the tournament too. Oh, just so you know, Daddy won the tournament. He also made the pell (the wooden thing holding the apple). I was able to have a snooze in the sunlight while we were waiting for people to show up. As you can see, I came prepared. Squeaky squirrel, check; honey bone, check; food and water, check. OH! I haven't introduced you to Squeaky Squirrel, maybe I can do that tomorrow. I also went walkabout and cheered on both Daddy AND Uncle Brett. That was tough, especially when they were fighting each other. I also got lots of cuddles. That's a great picture of Daddy and I isn't it? OH, and I made sure to give Brenda (she says I can call her Auntie Brenda) a nose kiss, because we're both September babies. Pei laughter. And, because I love you all, here's a nose shot to keep you going. Now excuse me, I'm exhausti-pei-ted and I'm going to nap. I am officially three years old. Before I get on to my life story, here's my weather report picture. The focus if off Mom, what were you thinking? S'ok, I still love you. I have a feeling it's going to be blechy today. Luckily, I grabbed some sun yesterday, so I have a bit of a supply to work with. Is everyone comfy? Good. It was three years ago today that I was born. Mommy and Daddy don't know all of the specifics, and I don't have a lot of memories of my being born day, I was very young at the time, but we do know that my birth mom had trouble in labour and that two of my sibs were born on the front steps of the house, one in the car and we think that I, being the runt, and possibly the youngest, was born on the steps of the vet hospital. Could you ever believe that I was the runt? It doesn't show anymore does it? Pei laughter. Guess what? Today is your birthday, Bolo! Happy birthday! Enjoy your special day! I don't quite know what all the plans are, but I heard something about a special shopping trip for a new toy! Wohoo! I hope it's a squirrel! I've already gotten my birthday cookie. Hmmm. What to do what to do. I think I will hide it for later. Shhhh. I've hidden it. I'll have it later, after my morning birthday nap. I'm sending hugs and wags and nose kisses to everyone today for just stopping by to celebrate with me! Friday Adventures, NO Weather Report!